INMARSAT Standard C system be- comes operational. Point, N.Y., and Newport, R.I., which are used for port and harbor design assistance, maritime re- search, and training of ships' offi- cers and harbor pilots. One of the latest contracts awarded to MSI was for shiphand- ling simulator training for four groups of Panama Canal pilots, with an option for four additional groups in 1990. The training consists of shiphan- dling and emergency exercises con- ducted in precisely simulated sec- tions of the Panama Canal, Cristo- bal and Balboa Harbors. The pilots experience unexpected situations while piloting various types of ships. The handling characteristics of 24 different types of ships are modeled in the simulator's computer. Up to 10 other ships can be seen as pass- ing, crossing or lock traffic. The Panama Canal pilots are be- ing trained at MSI's Newport facili- ty, which houses four interactive ship simulators. Each simulator provides the pilot with a ship's bridge (or bridge wing) from which he sees a realistic visual scene of a portion of the 50-mile long canal. The visual includes waterways and locks, cultural features, navigation aids and other ship traffic. The pilot issues commands and his "ship" reacts as it would in real life. March, 1989 17 1 using its advisory and prompting messages. All waypoint entries can be made using Lat/Lon, TDs, Range/Bearing or present position. The Loran pro- vides automatic chain and second- ary station selection, magnetic vari- ation, ASF (land mass) correction, waypoint sequencing and waypoint routing. There are nine routes avail- able with 20 waypoints in each route. Manual override functions provide maximum coverage in fringe areas. The navigational outputs include parallel routing for search patterns, specified approach heading, simul- taneous long and short run speed and course averaging, range and bearing to a waypoint or between waypoints, velocity made good (VMG), cross-track error (CTE), course error, time-to-go, ETA, and adjustable graphic course deviation scaling. Audible and visual alerts are pro- vided for waypoint arrival, anchor watch, cross-track error and borders (useful when nearing off-limit waters). Present positions can be saved by pressing the "SAVE" key and recalled later by pressing the t 1 f i • * v- \\ \ v V , - J. X. y v J"
SOME OF THE WORST WEATHER IN HISTORY. Hurricane Gloria, September 29,1985. Eighty knot winds and hundreds of boats damaged or destroyed. But some mariners had an Alden Marinefax™ weather chart recorder aboard and had prepared for the storm. 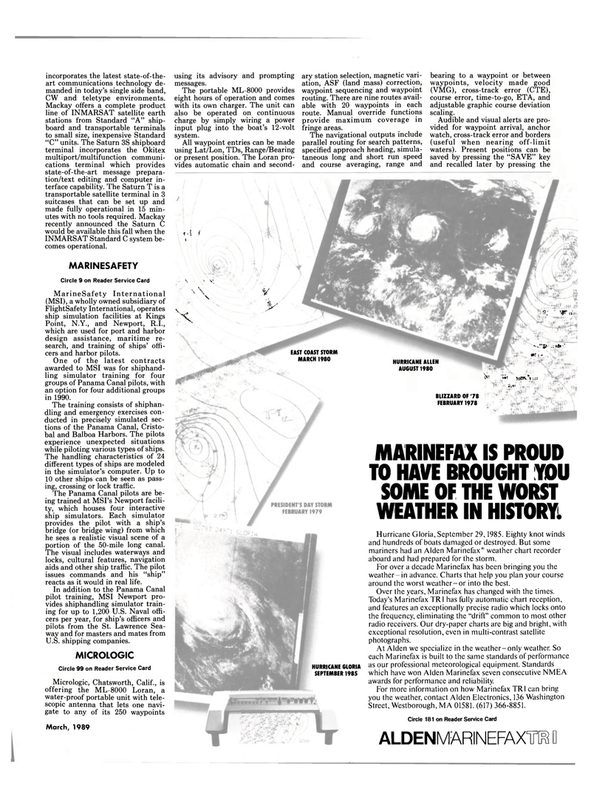 For over a decade Marinefax has been bringing you the weather- in advance. Charts that help you plan your course around the worst weather-or into the best. Over the years, Marinefax has changed with the times. Today's Marinefax TRI has fully automatic chart reception, and features an exceptionally precise radio which locks onto the frequency, eliminating the "drift" common to most other radio receivers. Our dry-paper charts are big and bright, with exceptional resolution, even in multi-contrast satellite photographs. At Alden we specialize in the weather-only weather. So each Marinefax is built to the same standards of performance as our professional meteorological equipment. Standards which have won Alden Marinefax seven consecutive NMEA awards for performance and reliability. Street, Westborough, MA 01581. (617) 366-8851.